Sharpening Hooks: Get the Point? Question: If the hooks I use are sharp enough to stick in my skin, why would I bother to sharpen them? Answer: Hook sharpening is one of those little, seemingly unimportant tasks that most freshwater fly fishermen simply never bother to do. As Siegfried implies, “sharp enough” is usually adequate. But those 10 percent of anglers who catch 90 percent of the fish know that the difference between a kind of sharphook and a very sharp hook is often the difference between just a strike and an actual hook up. If you have spent a lot of time and money learning to cast and present a fly with the best gear you can afford, why would you not take 30 seconds to ensure that the contact point between you and your quarry is as effective as it can be? Right out of the package, most fly hooks are very sharp. However, even sitting in a fly box for several months can start do dull the point, especially if you put your flies back before completely drying them. But the main causes of hook dulling are the rigors of actually fishing. 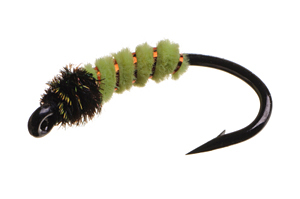 For nymphs and streamers, the danger is obvious: every time the fly hits a rock or gets stuck in a submerged stick, the hook point can be compromised. When you’re trying to cast a long line, sometimes your fly hits the rocks on the riverbank behind you, which can even break the hook point completely off. The same holds true for dry flies: snagging bushes, hitting structure during the cast, or any other time the hook point is exposed to any surface other than the water can cause dulling. As a result, you should inspect your hook point frequently and hone the point anytime you sense it has dulled. For nymph fishing, I’d check it every 5 or 10 casts or after any snag or suspected impact. Check your dry fly perhaps half as often, but again always inspect the point after any impact. If you feel the hook is dull, it’s time to sharpen. There are a number of hook hones and files on the market, and almost any of them will do the trick. You can probably also find something at your local hardware store for less money. As long as the surface is rough enough to file the metal and fine enough to allow you to sharpen small hooks, you’re in business. To sharpen a hook, hold it against the hone and draw it toward you. A few strokes are usually all you need to resharpen a hook, unless there’s obvious damage, such as a bent point. Don’t just sharpen one side, though. Perform the process on each side, as well as the bottom. To check if the hook is sharp enough, pull it across your thumbnail; if it sticks, you’re ready to fish again. Tom Rosenbauer offers step by step instructions here. This is a reminder that most saltwater anglers don’t need. Their hooks are much bigger and saltwater species often have very hard mouths, so the utility of hook sharpness is clearer. But many trout guys would see an uptick in their catch rates if they’d take a few minutes to make sure that a fish that tries to eat the fly is going to get stuck.